HomeIf the Purchase Funnel is Dead, it’s been Replaced by … What? If the Purchase Funnel is Dead, it’s been Replaced by … What? For most marketing professionals over the age of 30, the purchase funnel was one of the fundamental staples of their business training. 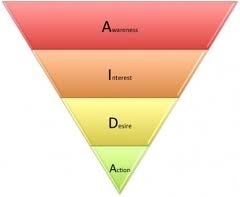 In fact, the famous “AIDA” model – which stands for awareness, interest, desire and action – was first posited as far back as 1898 by Elias St. Elmo Lewis, an American sales and advertising professional and business writer. “AIDA” was also the inspiration behind the classic purchase funnel – an orderly, simple path consumers take on the way to selecting and purchasing a product or service. AIDA has had a good run, because for more than a century, the AIDA purchase funnel has meshed neatly with the various advertising and MarComm tactics that have come along the pike – print advertising, direct mail marketing, radio, television – and even the Internet. While some people might contend that the advent of the Internet disrupted traditional buying processes, the greater reality is that it brought certain aspects of the buying process into sharper relief. Search engine optimization and search engine marketing stepped in to play nicely within the “interest, desire and action” steps. Even better, Internet marketing made ineffective “soft” attitudinal metrics less important; all of a sudden, it became much easier to make educated decisions about sales and marketing programs based on hard evidence. But with social media taking center stage, everything is now scrambled. The tidy “linear” purchase process just doesn’t reflect what’s happening now that “interactivity all over the place” is the thing. But what exactly is the new “thing” when it comes to the purchase process? There’s a lot of discussion … lots of thinking … but not much in the way of conclusions. McKinsey’s new model has been described as a “purchase cycle,” a “customer journey,” and various other alternative explanations — you can take your pick. But what exactly is that? When you look at how McKinsey attempts to graph it … it may be the proverbial “big ol’ mess.” I’ve pictured it here so you can try and have some fun with it. The “McKinsey Whatever” may be hard to grasp pictorially, but there’s one thing’s about it: it’s surely not linear. There are two circles (kind of). Consumers can go around within the circles forwards or backwards. They can also go sideways between the two (sort of). 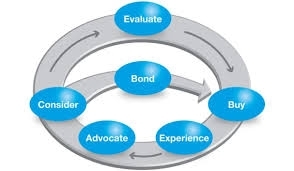 Bond goes on to posit that introducing this new model was a masterstroke on the part of McKinsey (wittingly or unwittingly) because it’s become a boon to its consulting business: Companies have to hire McKinsey so the consulting firm can explain it, he notes wryly. Whether it’s the McKinsey diagram or any other one that’s been proffered recently in an attempt to illustrate the new purchasing paradigm (one being a Google model with the eyebrow-raising acronym “ACID”) – what’s clear is that the purchase process is more complex then ever before. And in that process, the number of touchpoints has also grown dramatically. Perhaps the best thing to do is to jump out of the funnel (or box, or circles, or whatever the purchase cycle is today). Instead of focusing on impressions or touchpoints, let’s remember the big thing that interactivity has placed in the hands of purchasers: far more opportunity to see and hear what trusted influencers are saying about products, services and brands. It’s like going back to traditional, pre-1900 word-of-mouth advertising — and putting it on steriods. Before trust: Even if the brand is known, it’s not yet trusted because no credible third party has validated the brand in the eyes of the buyer. Trust exists: An interaction happens with a trusted influencer who recommends the brand or has positive things to say about it. Advocacy: Nirvana for companies, wherein a highly satisfied customer also becomes a brand advocate, providing third-party validation and attracting additional new customers because of the resulting brand credibility. Incidentally, the above scenario is particularly effective in the B-to-B world, where credibility and the “CYA” impulse have always played big roles in guiding business buyers to make purchase decisions they won’t regret later. Consider it the IBM principle, writ large: You’ve probably heard the adage that “nobody ever got fired for recommending IBM.” Now, in the “Age of Interactivity,” that principle can apply across the board. Looks to me like a lot of self-fulfilling, job-creating systematification of an immensely overblown “make people buy crap they don’t really need”-based economy. inflation can be blown into the thinning bubble of the market.